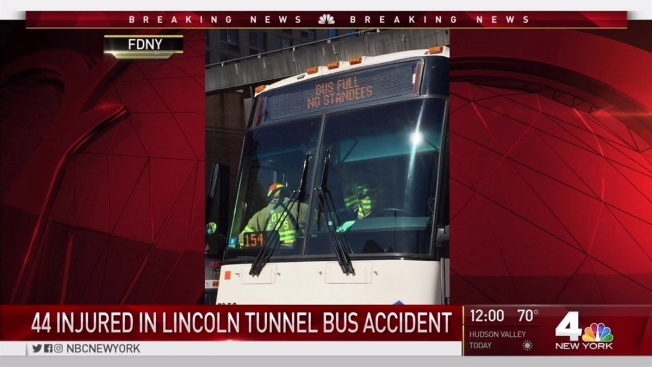 An accident involving two NJ Transit buses shut down the Lincoln Tunnel's center tube into New York City Monday morning, causing delays of nearly two hours and injuring dozens. Some 44 people were hurt, though the injuries were not considered life-threatening. Port Authority spokesman Joe Pentangelo said the most serious injury was a broken jaw. One of the bus drivers involved was ticketed for an unsafe lane change. NJ Transit spokeswoman Lisa Torbic says a bus headed from Ridgefield rear-ended a bus out of Fairview shortly before 9 a.m. Pentangelo said the door of one bus had to be cut open to get passengers out. Photos from the scene showed a smashed windshield on one of the buses; witnesses said passengers and bags went flying at the time of impact. Both buses were removed by 10:25 a.m., but motorists heading into New York City faced major delays. Live traffic cameras showed massive gridlock at the tunnel entrance for hours afterward, with cars crawling forward. One witness to the accident scene reported being stuck behind the disabled bus for 45 minutes before moving again.